DrSkinSpa.com, a well-regarded e-retail site for skin care products, takes pride in providing consumers with clinically developed anti-aging innovations to the public via their wide array of dermatological products. DrSkinSpa.com is excited to announce the addition of Dermablend Cover Crème 1 oz chroma 5 Olive Brown to their wide family of skin care product offerings. 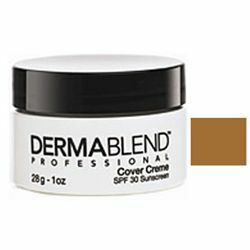 Dermablend Cover Crème 1 oz chroma 5 Olive Brown is a creamy foundation that is not heavy, as many camouflaging foundations can be. This product will professionally conceal skin imperfections. With Dermablend cover crème, the user will receive continuous hydrating protection in addition to evening out the skin tone. A full 12 hours of skin imperfection coverage and hydration is attained with Dermablend Cover Crème 1 oz chroma 5 Olive Brown. The ingredients found in this Dermablend cover crème allow the skin to look and feel refreshed, silky, and smooth. The Dermablend product line is available in a wide range of skin shades to fit every consumer’s personal complexion needs. With Dermablend Cover Crème 1 oz chroma 5 Olive Brown, those with a general “Tan” complexion can choose this particular “Olive Brown” shade to get a more exact matching shade for that skin tone. Other general shades to then choose more personal shades from include “Deep,” “Medium,” “Light,” and “Fair.” Within these shades, 4 or 5 more exact shades can be chosen for an individualized match to camouflage flaws. This crème need only be used in small amounts if just a small imperfection needs to be camouflaged. On the other hand, the product will blend quite easily for full facial coverage if necessary. When this Dermablend cover crème is set with Dermablend Setting Powder, an even longer lasting look is achieved (16 hours). Dermablend cover crème can bring back or sustain the appearance of youth with its age-defying hydration and total coverage abilities. The DrSkinSpa.com skin care site is operated and owned by a medical professional. The site’s founder assesses and then selects only the finest quality, scientifically proven products to include in their skin care line. DrSkinSpa.com gives its customers a 14-day money-back guarantee for every product sold. Their site also provides an exclusive 120% price protection guarantee in addition to free shipping of orders. Esthetician consultations are also available at no cost. DrSkinSpa.com is owned by Crescent Health Center and is based in Anaheim, California.